Opened in 1969, the Country Club at Silver Springs Shores has been host to a variety of mini-tour and U.S. Open Section qualifying events. It is known for having some of the fastest and most severe greens in the area. Desmond Muirhead, a longtime associate of Jack Nicklaus, designed the golf course, giving it a different character on the front and back nines. The 18-hole Country Club of Ocala in Ocala, FL is a private golf course that opened in 1994. Designed by Steve Nugent, Country Club of Ocala measures 7007 yards from the longest tees and has a slope rating of 141 and a 73. The 18-hole Golden Ocala Golf & Equestrian Club in Ocala, FL is a private golf course that opened in 1986. Designed by Ron Garl, Golden Ocala Golf & Equestrian Club measures 7062 yards from the longest tees and has a slope rating of 140 and a 74. The 18-hole Huntington Golf Club in Ocala, FL is a public golf course that opened in 1989. Huntington Golf Club measures 6563 yards from the longest tees and has a slope rating of 124 and a 71.1 USGA rating. The course features 3 sets of tees for different skill levels. The 18-hole Lake Diamond Golf & Country Club in Ocala, FL is a semi-private golf course that opened in 1998. Designed by Miles Christian Anderson, Lake Diamond Golf & Country Club measures 6650 yards from the longest tees and has a slope rating of 139 and a 73. The 18-hole Links at On Top of the World in Ocala, FL is a private golf course that opened in 1982. Designed by Ken Colen, Links at On Top of the World measures 6311 yards from the longest tees and has a slope rating of 113 and a 69. The 18-hole Marion Oaks Country Club in Ocala, FL is a public golf course that opened in 1980. Designed by John Denton, Marion Oaks Country Club measures 7031 yards from the longest tees and has a slope rating of 130 and a 72. The 18-hole Ocala Golf Club in Ocala, FL is a public golf course that opened in 1920. Designed by Lloyd Clifton, Ocala Golf Club measures 6552 yards from the longest tees and has a slope rating of 125 and a 71. The 18-hole Ocala National at Golden Hills Country Club is a semi-private golf course that opened in 1964. Designed by Charles Pace and Lee Popple -- and later redesigned by Rees Jones -- Ocala National measures 7,364 yards from the longest tees and has a slope rating of 141 and a 75.9 USGA rating. 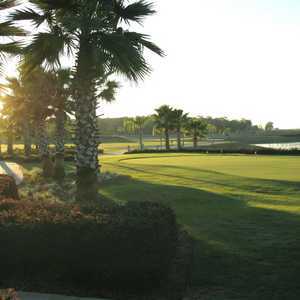 The 18-hole Ocala Palms Golf & Country Club in Ocala, FL is a semi-private golf course that opened in 1996. 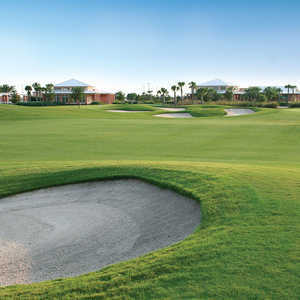 Designed by Steve Nugent, Ocala Palms Golf & Country Club measures 6501 yards from the longest tees and has a slope rating of 130 and a 72 USGA rating. The 18-hole Pine Oaks Golf Club in Ocala, FL is a public golf course that opened in 1987. Designed by Ron Garl, Pine Oaks measures 6533 yards from the longest tees and has a slope rating of 124 and a 71.1 USGA rating. The course features 4 sets of tees for different skill levels. The 18-hole Rolling Greens Executive Golf Course in Ocala, FL is a semi-private golf course that opened in 1977. Rolling Greens Executive Golf Course measures 2505 yards from the longest tees. The course features 3 sets of tees for different skill levels. The brilliant Terry LaGree design harmonizes with spectacular scenery to create Royal Oaks -- a unique and picturesque course. Powder sand bunkers dot undulating fairways lined by stately oaks and shimmering water. Stone Creek Golf & Country Club stretches across more 185 acres of Ocala's rolling hills and lush green countryside. The lengthy course stretches to 7,221 yards from the back tees. 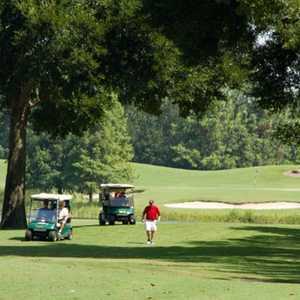 The challenging layout is known for being one of the best public golf courses in Ocala and the surrounding area. The 18-hole SummerGlen Country Club in Ocala, FL is a public golf course that opened in 2000. SummerGlen Country Club measures 6673 yards from the longest tees and has a slope rating of 127 and a 71.6 USGA rating. The course features 5 sets of tees for different skill levels. The 18-hole Tortoise & Hare at On Top of the World in Ocala, FL is a private golf course that opened in 1982. Tortoise & Hare at On Top of the World measures 6233 yards from the longest tees and has a slope rating of 121 and a 69.